The FIFA World Cup is more than just a contest that decides the best team in international football. It is also a crucible of footballing fire in which players are subject to intense personal scrutiny, estimation and re-estimation. It is where new myths are written, and old myths are put to rest. All of which might make you think that the World Cup is the ideal venue for good teams with one or two superstars to sweep to victory. But in fact things aren’t that simple. If they were, both Lionel Messi and Cristiano Ronaldo would have a few additions to their trophy cabinets by now. In fact there is a certain ‘corporate’ logic to the way in which the best football teams achieve success at the FIFA World Cup tournament. Like most good companies, good teams succeed because they not only boast star players, but also a highly effective team setup that helps to draw the best out of these individual superstars. Or to put it in another way--a Messi alone does not a World Cup winning team make. Consider the victorious German campaign in 2014. James Rodriguez, a Colombian, top-scored in that tournament with 6 goals. Germany’s Thomas Muller came second with 5. Lionel Messi won 4 Man of the Match awards--remarkable considering that Argentina only payed 7 matches in the tournament. No German came close, with Mario Gotze and Thomas Muller each winning 2 MOM awards each. Germany kept 4 clean sheets, but then so did the Netherlands and Argentina. A post-tournament All-Star Team put together by sponsors Castrol, using a proprietary Castrol Performance Index, featured five German players, but not Mario Gotze. One way of reading all these statistics is that Germany won that tournament because they were able to generate consistent performances across the length and breadth of their squad without overly depending on a single player. 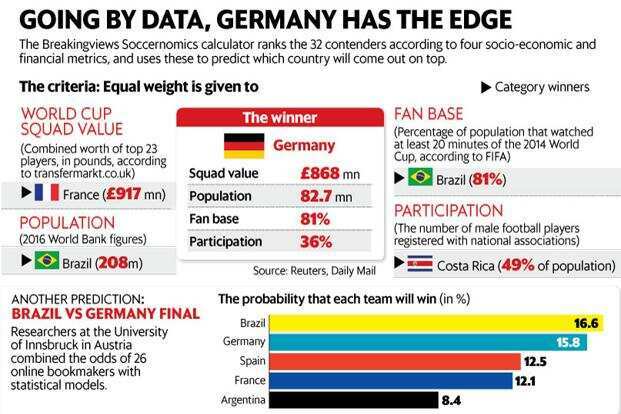 Adjust the outrageous 7-1 win against Brazil, and Germany has even fewer individual outliers. The statistics for the 2010 World Cup in South Africa can be read in similar fashion. Spain won that World Cup scoring just 8 goals. And player with the most Man of the Match awards? The dutchman Wesley Sneijder. Indeed, smart punters will do well to keep an eye on that Man of the Match table in Russia. If Messi or Ronaldo are to really finally take a World Cup winner’s medal, they will hope that it’s not their names on the top of that list. As any titan of the corporate world will tell you, stars win battles, but only teams win wars. Things will be no different in Russia.